Part of the Minobu line (JR Central) for the class 115 train. 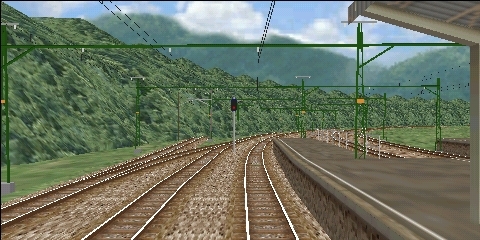 The simulated alternative is a local train from Higashi-Hanawa to Fujinomiya. The line is electrified and goes through a beautiful landscape; the creator of this route has done a fantastic job creating the landscape! About the Minobu line at Wikipedia. The website for this route has disappeared from the Internet more than 10 years ago. Graphical objects for the Minobu line. Route files for the Minobu line.